(m= 12-14; n = 5-6; p = 10-14). Surface-exposed lipids are synthesized in the cytosolic compartment of mycobacteria and are subsequently translocated toward the cell envelope outer layers by active transport systems. Mycobacterial membrane protein Large (MmpL) transporters, a subclass of Resistance-Nodulation-Cell Division transporters, appear to play a major role in this process, acting as scaffold proteins that couple lipid synthesis and transport. However, despite recent progress, the mechanisms involved in the export of lipids remain poorly understood. To address this question, we focus on the study of trehalose polyphleates (TPP) transport in M. smegmatis. TPP transport shares many similarities with export systems of various families of surface-exposed lipids in the tubercle bacillus, and can serve as an informative model to describe lipid export in mycobacteria. Our specific aims are i) to decipher the mechanism of action of the MmpL transporters, ii) to investigate how lipid transport systems are organized in the mycobacterial cell envelope, iii) to identify new proteins involved in transport, iv) to explore whether lipid transport is coordinated with cell division or cell elongation. Another goal of the team is to develop new drugs to treat infections caused by mycobacteria, including M. tuberculosis and M. abscessus. We sought to identify molecules that specifically inhibit a family of enzymes, the Phosphopantetheinyl transferases (PPTases), by high-throughput screening approaches. 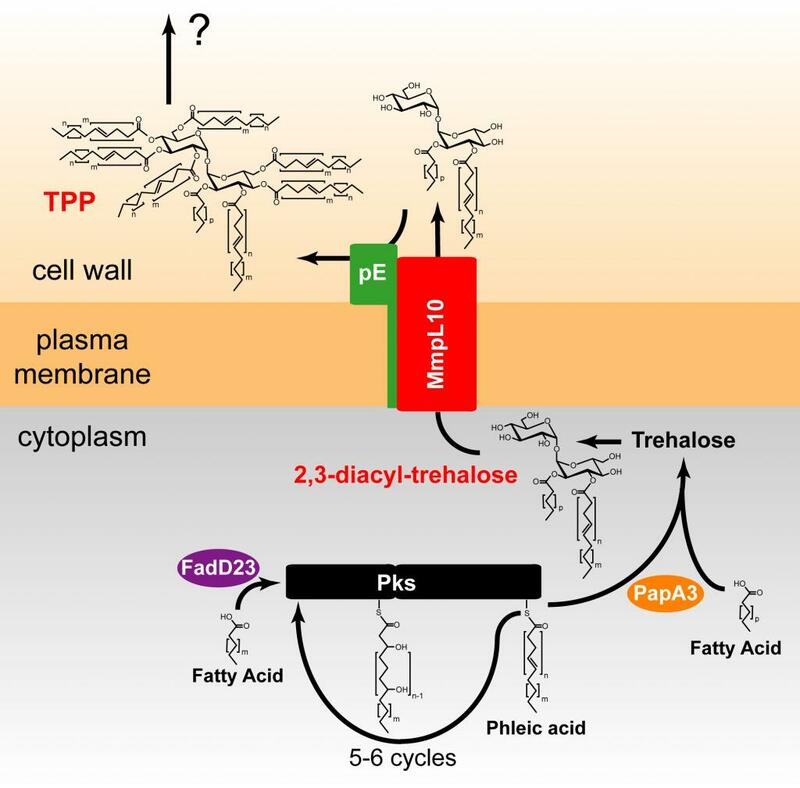 We established that PPTases play a central role in the formation of major cell wall components and various lipid virulence factors in mycobacteria and represent attractive drug targets. To date no inhibitor against these enzymes for use in clinical treatment has been described. This project is performed in close collaboration with the team of Lionel Mourey at IPBS. M. Daffé (IPBS, Toulouse), L. Mourey (IPBS, Toulouse), F. Baltas & Y. Génisson (CNRS, Toulouse), J.Y. Bouet (CNRS, Toulouse), E. Oswald (INSERM, Toulouse), J. L. Herrmann (INSERM/ Université Versailles), L. Kremer (CNRS/INSERM, Montpellier). Chalut (2016). MmpL transporter-mediated export of cell-wall associated lipids and siderophores in mycobacteria. Tuberculosis, 100, 32-45. Burbaud et al. (2016) Trehalose polyphleate, are produced by a glycolipid biosynthetic pathway conserved across phylogenetically distant mycobacteria. Cell Chem. Biol. 23: 278-289. Leblanc et al. (2012) 4’-Phosphopantetheinyl transferase PptT, a new drug target required for Mycobacterium tuberculosis growth and persistence in vivo. PLOS Pathog, 8: e1003097. Chalut et al. (2006) The non redundant roles of two 4’-phosphopantetheinyl transferases in vital processes of Mycobacteria. Proc. Natl. Acad. Sci. USA, 103 :8511-8516.